The Monticello house has three floors and a basement. This was the main living area for Jefferson and his family. One of the most unique aspects of Jefferson�s design for Monticello was his incorporation of the "dependencies," or essential service rooms, beneath raised, L-shaped terraces extending from either side of the house. The house�s orientation in relation to the hillside enabled Jefferson to locate the dependencies next to the house without having them visible from the level of the primary entrances. The dependency wings were connected to one another through the cellars in the house�s basement by an all-weather passageway. At the end of each dependency wing is a small pavilion, each of which had living or office space on the upper level and a work space in the lower. Although connected to the house by the L-shaped wings, the pavilions are truly separate structures. The South Pavilion was the first structure built on the mountaintop, while its counterpart, the North Pavilion was constructed over 30 years later after Jefferson had greatly reworked his design for Monticello. 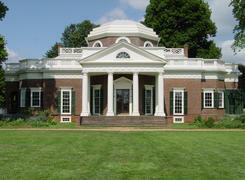 Dimensions Main House: 110' long, 87'-9" wide (to outer faces of porticoes), 44'-7" high (to oculus of dome).